Used for Roofing Installation Cost Estimator for Excel, enhance your productivity and accuracy with this easy-to-use software! RoofCOST Estimator for Excel is designed for roofing contractors, builders, remodelers, and do-it-yourselfers. Contains user modifiable cost data and intelligent takeoff area calculator with addons, cutoffs and roof pitch. Saves time and improves accuracy. Estimates conveniently by section breakdown. ...... Use RoofCOST Estimator for Excel as an estimating and sales tool to save time, improve accuracy and achieve greater success. RoofCOST Estimator for Excel is designed and developed in the USA by CPR International, Inc., a leading provider of cost estimating software tools and cost data for the construction industry since 1986. 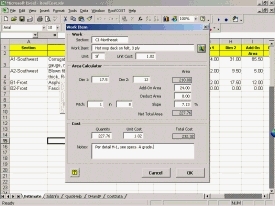 Use RoofCOST Estimator for Excel with confidence and profit! RoofCOST Estimator for Excel's area calculator will quickly figure out areas including cutoffs and addons. the Estimator for Excel also will calculate actual areas based on roof pitch. RoofCOST Estimator for Excel does the mundane work so you don't have to. Make Paint Cost Estimating Productive and Fun. Qweas is providing links to RoofCOST Estimator for Excel 11.0 as a courtesy, and makes no representations regarding RoofCOST Estimator for Excel or any other applications or any information related thereto. Any questions, complaints or claims regarding this application RoofCOST Estimator for Excel 11.0 must be directed to the appropriate software vendor. You may click the publisher link of RoofCOST Estimator for Excel on the top of this page to get more details about the vendor.